Four years in to running her business, Kim was gaining a reputation for creating beautifully emotive films and are steadily winning well paid work. She was in that familiar scenario - she might be attracting clients but they'e not necessarily the right fit and that can quickly become a business-limiting source of frustration. She was becoming increasingly aware that there’s more possibility and untapped potential within her business. When she approached Ditto, she was preparing to rename and rebrand her business to honour her dad and the constant source of inspiration that he provides, whilst also repositioning her business and honing her message. Berly is inspired by Kim’s father, who suffers with ALS. As a family, the Sprengers have endured some really hard times and seen a side of life that many do not. They’ve got through all of this by constantly looking for a reason to smile, and searching for comic relief in even the hardest of days. Where others might crumble, they have chosen to find positivity. Kim shot her first wedding video at her brother’s wedding. Filmed just before her father lost his voice to his illness, filming his speech had a particular poignancy and highlighted the importance of celebrating the here and now. Life doesn’t need to be pretty to be beautiful. Before I tell you more about the brand we created for Berly, please take a moment to watch this video. Kim created this video to educate others about ALS and let me tell you, it'll hit you hard. What I found from this video was that it made me cry, it made me smile and it filled me with awe for Mike's strength of character. I also went and hugged everyone I loved right after I watched it. Berly is a video agency that exists to inspire hope and to celebrate the magic and intangibility of the relationships around us, creating emotive and beautifully composed films that express the richness of the personalities in front of our camera. We believe in telling a richer story; with an unshakeable level of realness that can be as beautiful as it can be disruptive. The two seasons which best represent Berly are Spring and Autumn, in equal measure. Spring personalities are fast paced, fresh and absolutely full of life. Constantly bursting with new ideas, their fizzing energy inspires those around them and their positivity is contagious! They’re utterly irrepressible and love the lighter side of life; they’re big on fun. They’re hugely expressive and have a clarity and simplicity to them that reflects their openness and honesty. They are creative souls who thrive on being able to bounce ideas around with others. Meanwhile, Autumn personalities have a strength and substance to them. They’re ambitious, passionate and put their heart and soul into all that they do. They’re honest, evocative, bold and hard working. The combination of these two seasons will create a brand that’s warm, creative, unexpected and rooted in purpose. Perfect for Berly! Substantial, strong, bold and quirky, this brand runs to the beat of its own drum. It perfectly reflects the Spring and Autumn influences of Berly's brand personality: monoline illustrations and outlined typography create a sense of lightness while hand lettered scripts feel personal and approachable. Bold colours contrast against plenty of white space to keep everything feeling fresh and bright, while natural textures keep the mood relaxed, earthy and authentic. We created a series of animal illustrations for Berly to represent the characteristics of her brand: the bear represents strength and wisdom, the lion represents courage, the bison represents determination, the horse represents freedom and the llama represents weirdness and fun! 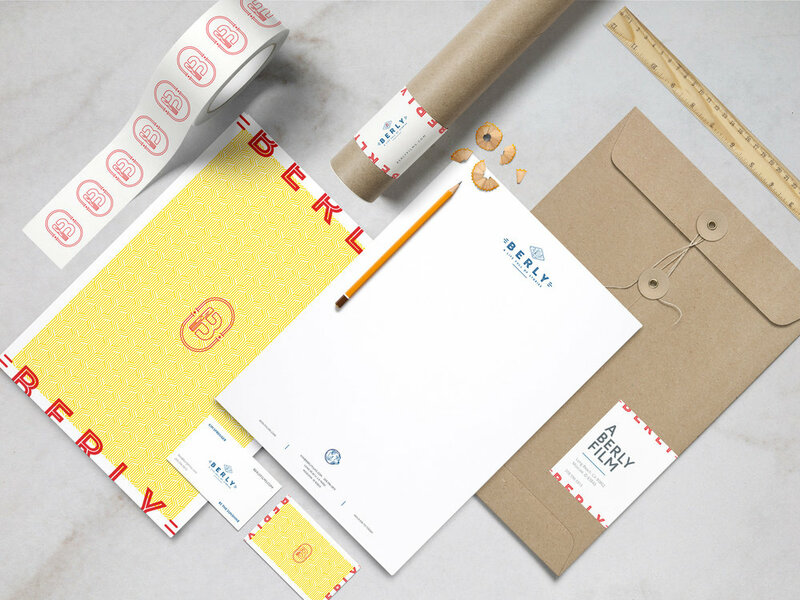 The elements of this brand collide to create an identity that has heaps of impact. It's big, bold and has an undeniable strength - yet also possesses a light, playful and creative edge that's true to Kim's personality. It's an unusual style to us but has been such a joy to create. Kim: I can't wait to see what you do next. You're an inspiration.